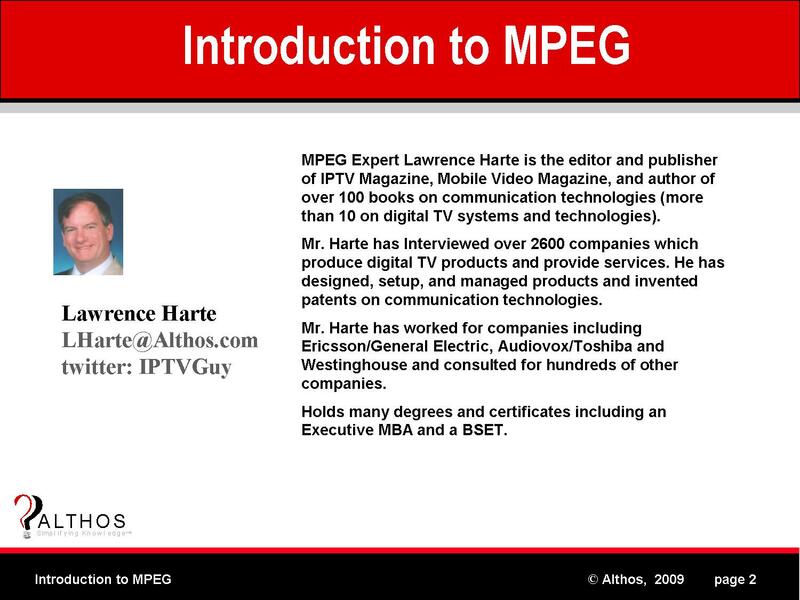 MPEG Expert Lawrence Harte is the editor and publisher of IPTV Magazine, Mobile Video Magazine, and author of over 100 books on communication technologies (more than 10 on digital TV systems and technologies). Mr. Harte has Interviewed over 2600 companies which produce digital TV products and provide services. He has designed, setup, and managed products and invented patents on communication technologies. Mr. Harte has worked for companies including Ericsson/General Electric, Audiovox/Toshiba and Westinghouse and consulted for hundreds of other companies. Holds many degrees and certificates including an Executive MBA from Wake Forest University and a BSET from the University of the State of New York. This book explains the basics of audio and video digitization and compression and the standard formats that are used be MPEG. You will learn about the different MPEG audio coders and video coder options.